I got some emails where users of my app ‚Week View‚ were telling me that they had to configure the app according to their preferences again after an update, which is annoying. From a technical point of view an update is the same as a new installation of an app – it does not „know“ that it already has been installed + every app runns in it’s own sandbox. Since every windows phone user has a skydrive account associated with his/her windows phone I implemented the option to save settings to skydrive and load them from there again. 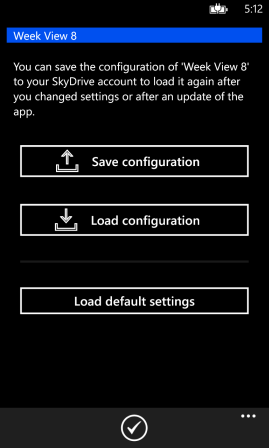 Additionally it will be possible to reset all app-settings to their default value. 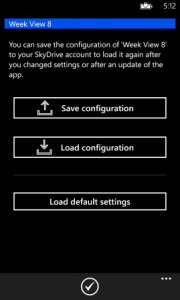 The next update will also contain other new features – here is, how the „Save/Load“ configuration settings page will look like. ← Why are appointments from google calendar shown as „private appointments“? I installed the latest update a couple of minutes ago. Trying to sve my confog to skydrive I get the following error message: „The Access token doesn’t have the correct permission for the ressource. The Access token must include one of the following scopes: ‚wl.skydrive‘.“. Sorry for this issue – I already fixed it an want to submit an updated version very soon. Meanwhile the only soltion, if you want to use this specific features, is to re-install the app.